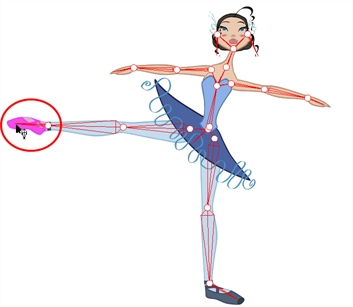 ﻿ Animate 3 Pro Online Help: Where to Start with Inverse Kinematics? User Guide > Cut-out Animation > Animating using Inverse Kinematics > Where to Start with Inverse Kinematics? 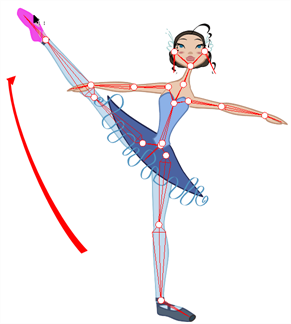 This section explains the basics of the Inverse Kinematics tool. IK works best when you lock a part of the character to the spot, such as a foot on the floor, then select the entire body or another extremity and move it. To lock a part in place, you use the IK Nail option. 2. In the Camera view, [Ctrl] + click (Windows) or [⌘] + click (Mac OS X) on a part of the body. 4. Hold down the [Shift] key and click on the pivot belonging to the part you want to lock in place. 5. Click on another part of the character and pull on it. 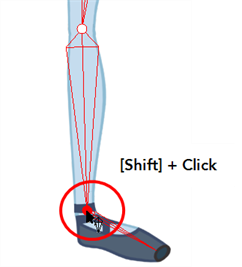 You can [Shift] + click on a bone to lock the orientation of the bone.